Books on abortion (other than collections of readings) typically express and defend a particular position. This book gives both sides, as evenly and objectively as possible; it gets to the heart of each position, the core idea which animates it. It then leaves the reader to make up his or her own mind. It is an introduction to the issue, not only to the basic positions on the issue. Despite being brief, it contains careful analyses and discussions of many topics often not found at all in other works. The treatment is thorough and detailed, but succinct. 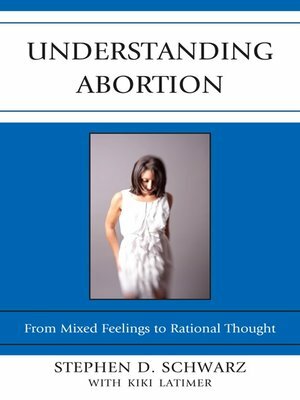 Understanding Abortion: From Mixed Feelings to Rational Thought is aimed at all people who want a better understanding of what the two sides on this issue are really saying, and what reasons they give for their position. Many people assume that this issue is an interminable one, with "no clear answers"; a purely emotional debate that cannot be addressed by the use of reasoned arguments. The book shows that this is not the case.